Quiet when it's appropriate and yet fierce when it wants to hurt, and it does hurt. I felt the pain as I watched human beings fall in the streets, beaten under a shroud of darkness, shot dead for no apparent reason beyond the color of their skin. Selma is a film that will effectively resonate with me for those moments that brought tears to my eyes, as if I was transported back to the time when such atrocities really took place rather than watching a modern day cinematic re-creation. At certain times throughout Selma, the film flat out had me. It had it's powerful narrative wrapped around my soul and was shaking me, refusing to loosen it's grip...and then suddenly it would let go, which is unfortunate. A victim of uneven pacing, just when I thought the film's director Ava DuVernay had a pitch perfect handle on exactly what to do with the material, she would temporarily fall back into the familiar biopic tropes and thus let the foot off the gas pedal. At it's best though, Selma is a film that makes you want to stand up immediately and march right along side the characters on screen, ignoring the hatred and the danger tossed in your direction because you know it's right and you know it is a cause that absolutely means something to humanity. I can't confidently say that I feel DuVernay was deserving of an Oscar nomination for her direction of Selma, mostly because I think her weaknesses were occasionally evident, but it's undeniable that at times she knew exactly how to make an audience feel the power and importance of this picture, whether it be through framing or brilliant camera angles like when we feel as if we are marching behind Martin Luther King Jr. Granted, if we are comparing her work here with an actual nominee, say the by the numbers, bland and completely underwhelming craft of Morten Tyldum on The Imitation Game, then DuVernay absolutely was snubbed, but dare I say Fincher anyone? Yes, I felt compelled to take a side swipe shot at Tyldum here. I still can't get over that nomination. But I digress. 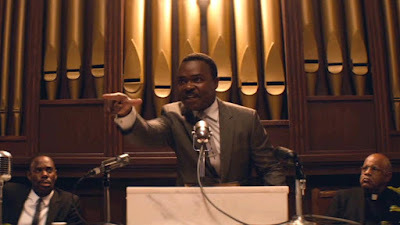 What is apparent is the glaring oversight of David Oyelowo in the lead role of Martin Luther King Jr., an absolutely brilliant and measured performance that captivated with every word, every look, every mannerism no matter how seemingly slight. Without a doubt one of the finest efforts of 2014, and it is difficult to discern how he didn't find his name mentioned among the five most elite performances of the year. I can fault various aspects of the film for letting me down because they were glaring due to the rest of the work feeling so faultless, but across the board the acting was rock solid, with Oyelowo leading the way with complete perfection. 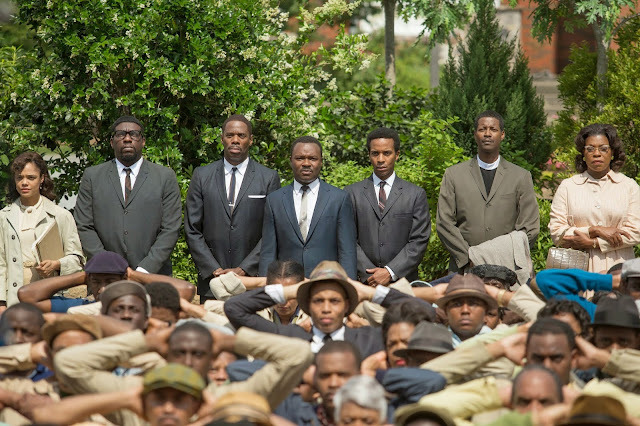 At the end of the film Selma, it feels as if a victory had been won and of course it absolutely had been. The events depicted showcase a major moment for the Civil Rights Movement, and it is worthy of a joyous and optimistic tone, but I feel saddened and ashamed that a racial divide still exists in America in 2015. Is it as tense and hostile as the 1960's and earlier? Of course not, but nevertheless I still occasionally see a proudly waved confederate flag or hear some disgusting rhetoric about "what's wrong with this country" with a finger pointed at a specific race, and it's unsettling to say the least. The optimistic part of me thinks its possible that my now seven year old daughter will see a world sooner rather than later in which we see far less hatred expressed for such ludicrous things like skin color or religious beliefs, but unfortunately I worry that is far fetched. All I can do is teach her to avoid stereotypes and bias and bigotry, an understanding that all people deserve equal rights and equal treatment. Martin Luther King Jr. marched us down the right path, but we must continue on because the work is not yet done. This may sound funny but one thing I "enjoyed" if you will, was the violence of the movement was sparingly sprinkled into the movie. I thought the Peace effort was relied upon greatly and would make sense with Dr. King in mind. That goes without saying but it's just an observation of the difference in the presentation of Selma and the times. I can view Selma through the eyes of a mature adult presently and I'm one who can view it once again with the eyes of a young preteen girl in the early 60's. Of course it has a much more prolific effect upon the adult but the girl still remembers the police holding fire hoses and pushing people back with water. Burning crosses and rocks through windows. George Wallace's figure on a step in defiance. What a time. 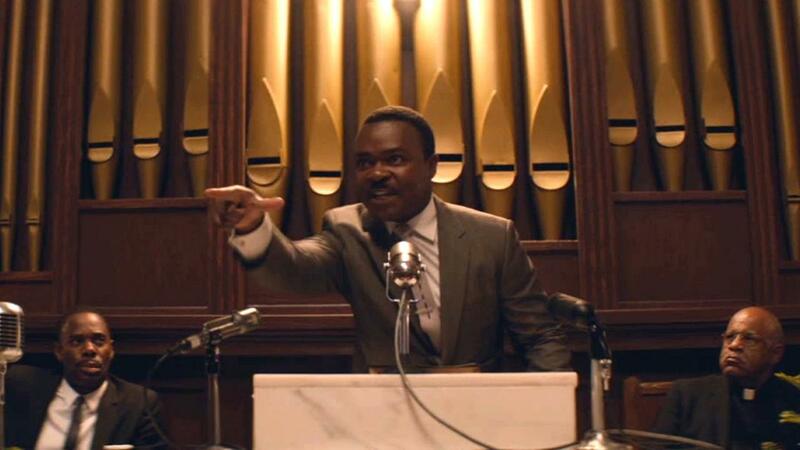 As for the snub of David Oyelowo, we all know what a fantastic portrayal he gave of Dr. King. Out of the park! The great part is the actor knows he was born for this role. That alone overcomes any snub of any Academy. Excellent thoughts Barbara, I really appreciate it. I agree completely, the violence was utilized so perfectly, as you said "sprinkled" rather than portrayed to the point of overkill. This is exactly what made me feel quite the opposite about Unbroken, literally the entire time felt like I was just watching a man get beat up, it went well beyond being anything powerful and was just exhausting. Too true regarding Oyelowo, at the end of the day the Oscar nomination really is meaningless. Not to him, I have read all about the way Oscar recognition can advance the career of an actor, but years from now I barely remember who actually was nominated year by year, but I don't forget the actual performances.